Gemma Lyons served as UN Volunteer Technical Officer on the World Health Organization's regional Cancer Control Programme in the Arab States. Hailing from the United Kingdom and with a background in public health, she shares her experience, serving under the United Nations Volunteers (UNV) programme in Egypt. 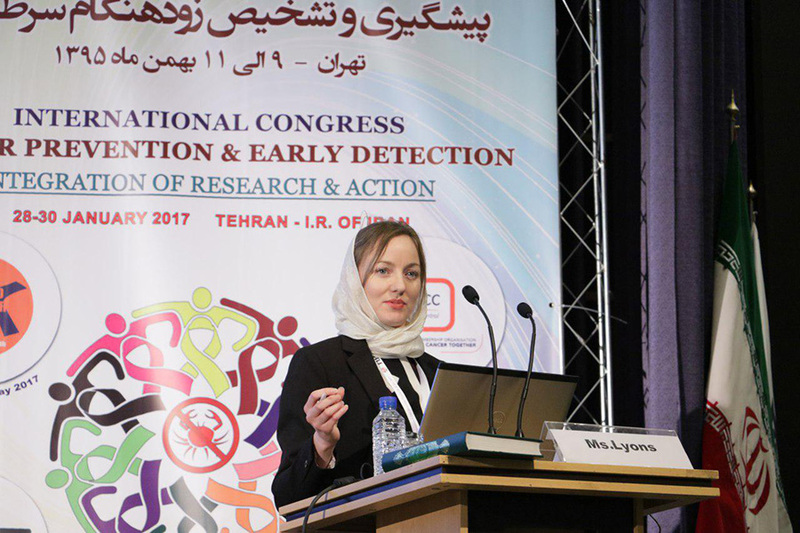 Gemma Lyons (United Kingdom), UN Volunteer Technical Officer on the WHO Cancer Control Programme, presents WHO's regional recommendations on early diagnosis of cancer at an international conference in Tehran, Iran. I served as a UN Volunteer at the WHO Regional Office for the Eastern Mediterranean in Cairo, Egypt, from May 2016 until May 2017. This was a fantastic opportunity for me, both professionally and personally. My role at WHO was a Technical Officer on the Cancer Control Programme. This meant that I was able to draw on the skills and experience I had gained as a Public Health Strategist in the United Kingdom, and to gain new experience and exposure at an international level. WHO had always been the organization I had wanted to work for – arguably it has the biggest impact on population-level health globally. And I wanted to be part of it, to have as much impact on the world as I can. One of my key tasks was the development of a Framework for Cancer Control in the region. And after substantial consultation with experts, it was successfully endorsed at the Regional Committee in October 2017! I also wrote a paper on palliative care in the region, published in the Lancet Oncology, and a blog post on palliative care in humanitarian crises, published by the European Association for Palliative Care (EAPC). Another great opportunity I had was to present WHO’s regional recommendations on early diagnosis of cancer, at an international conference in Iran in January 2017. This was probably the best part of my UNV experience! I presented on three topics at a conference with more than 200 attendees, and I was on a discussion panel on each day of the event. It was challenging, but also such a fantastic feeling to represent the organization and to share and discuss evidence-based policy recommendations. UN Volunteer Gemma Lyons, UN Volunteer Technical Officer on the WHO Cancer Control Programme, presents WHO's regional recommendations on early diagnosis of cancer at an international conference in Tehran, Iran. I was also part of a UN Inter-agency taskforce mission on non-communicable diseases, in Bahrain. The taskforce is a collaboration of UN agencies that work together to develop a multi-sectoral approach to non-communicable diseases. Rather than seeing the non-communicable disease epidemic as a 'ministry of health problem', this approach engages other ministries and sectors that have a vital role to play, including education, communication, environment and employment. The trip was very full-on; back-to-back meetings with various organizations and ministries. It was a great way to engage with policy-makers as a joint-UN team. And while the UNV position provided me with many excellent opportunities to develop professionally, it was also a journey at the personal level. Life in Cairo was hectic, buzzing and always busy. Filled with cultural events, dinners with friends, and weekend trips to remote oases. I made a number of close friends from all over the world, who I have since met up with again in London, Geneva, Mexico and Guatemala!